"Grow. Guide. Serve. For a better life... Go PCH"! Alegna ALS is a personal care home agency and management services provider ready to accommodate your needs. Our specialization is in placing disabled residents aged 18 years old and above in personal care homes that provide intimate and comfortable accommodations. We also offer home management services and health education training. Clients are also welcome to request for free nursing consultations where they can ask critical questions about Personal Care Home placement for their loved one through our network. Being owned and managed by a team of Registered Nurses, Alegna ALS is confident that our services can meet your requirements for Personal Care. 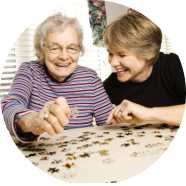 We help find the most suitable care facility that could potentially become your second home. As a caregiver, looking after someone with a major disease, disability, dementia, or illness can be a daunting prospect. Besides help from family and friends, you will need all the support, advice and information you can get. Do you believe there are enough resources available in Georgia? What are some of the problems you face caring for someone in need? We want to hear from you. Let us know. We will appreciate any recommendations you can send to Alegna ALS. Always be up to date! Subscribe to our newsletter. Placement for private pay clients & those who choose to pay with insurance.